Toronto Area Information - GoWest Realty Ltd. If you have any questions about Toronto, Ontario please Contact Us. If you are planning on buying your next dream home visit our Buyers Page. If you are planning on selling your home visit our Sellers Page. Toronto is the largest city in Canada and the provincial capital of Ontario. It is located in Southern Ontario on the northwestern shore of Lake Ontario. A relatively modern city, Toronto's history dates back to the late 18th century, when its land was first purchased by the British monarchy from the Mississaugas of the New Credit. The settlement was later established as the Town of York and proclaimed as the new capital of Upper Canada by its lieutenant-governor, John Graves Simcoe. In 1834, York was incorporated as a city and renamed to its present name. The city was ransacked in the Battle of York during the War of 1812 and damaged in two great fires in 1849 and in 1904. Since its incorporation, Toronto has repeatedly expanded its borders through amalgamation with surrounding municipalities, most recently in 1998. The City of Toronto has 2.6 million residents, according to the 2011 Census. It is currently the fifth most populous city in North America. The census metropolitan area (CMA) had a population of 5,583,064, and the Greater Toronto Area (GTA) had a population of 6,054,191 in the 2011 Census. Toronto is at the heart of the Greater Toronto Area, and the densely populated region in Southern Ontario known as the Golden Horseshoe. Its cosmopolitan and international population reflects its role as an important destination for immigrants to Canada. Toronto is one of the world's most diverse cities by percentage of non-native-born residents, with about 49% of the population born outside Canada. Toronto is also consistently rated as one of the world's most livable cities by the Economist Intelligence Unit and the Mercer Quality of Living Survey. As Canada's commercial capital and one of the world's top financial centres, Toronto is considered an alpha world city by the Globalization and World Cities (GaWC) study group. It is home to the Toronto Stock Exchange, the world's seventh largest in terms of market value. Toronto contains more corporate headquarters than any other Canadian city, including those of Canada's five largest banks. Toronto's leading economic sectors include finance, business services, telecommunications, aerospace, transportation, media, arts, film, music, television production, publishing, software production, medical research, education, tourism, engineering, and sports industries. According to Forbes, Toronto is the tenth-most economically powerful city in the world and one of the fastest growing among the G7 nations, whilst PwC ranks the city as the world's second-best "metro powerhouse". Toronto was ranked twelfth in the world and fourth in the Americas in 2010 for economic innovation by 2thinknow. The cost of living in Toronto was ranked highest in Canada in 2011. The city is intersected by three rivers and numerous tributaries: the Humber River in the west end and the Don River east of downtown at opposite ends of the Toronto Harbour, and the Rouge River at the city's eastern limits. The harbour was naturally created by sediment build-up from lake currents that created the Toronto Islands. The many creeks and rivers cutting from north toward the lake created large tracts of densely forested ravines, and provide ideal sites for parks and recreational trails. However, the ravines also interfere with the city's grid plan, and this results in major thoroughfares such as Finch Avenue, Leslie Street, Lawrence Avenue, and St. Clair Avenue terminating on one side of ravines and continuing on the other side. Other thoroughfares such as the Prince Edward Viaduct are required to span above the ravines. These deep ravines prove useful for draining the city's vast storm sewer system during heavy rains, but some sections, particularly near the Don River are prone to sudden, heavy floods. Toronto has a humid continental climate, with warm, humid summers and cold winters. The city experiences four distinct seasons, with considerable variance in day to day temperature, particularly during the colder weather season. Owing to urbanization and its proximity to water, Toronto has a fairly low diurnal temperature range (day-night temperature difference). The denser urban scape makes for warmer nights year around and is not as cold throughout the winter than surrounding areas (particularly north of the city); however, it can be noticeably cooler on many spring and early summer afternoons under the influence of a lake breeze. Other low-scale maritime effects on the climate include lake-effect snow, fog and delaying of spring- and fall-like conditions, known as seasonal lag. Toronto winters sometimes feature short cold snaps where maximum temperatures remain below −10 °C (14 °F), often made to feel colder by wind chill. Snowstorms, sometimes mixed with ice and rain can disrupt work and travel schedules, accumulating snow can fall any time from November until mid-April. However, mild stretches with temperatures in the 5 to 12 °C (41 to 54 °F) range and infrequently higher also occur in most winters melting accumulated snow. The summer months are characterized by long stretches of humid weather. Usually in the range from 23 °C (73 °F) to 31 °C (88 °F), daytime temperatures occasionally surpass 35 °C (95 °F) accompanied by high humidity making it feel oppressive during these brief periods of hot weather. Spring and autumn are transitional seasons with generally mild or cool temperatures with alternating dry and wet periods. Lawrence Richards, a member of the faculty of architecture at the University of Toronto, has said "Toronto is a new, brash, rag-tag place—a big mix of periods and styles." Toronto buildings vary in design and age with many structures dating back to the mid-19th century, while other prominent buildings were just newly built in the first decade of the 21st century. Defining the Toronto skyline is the CN Tower, completed in 1976. At a height of 553.33 metres (1,815 ft 5 in) it was the world's tallest freestanding structure until 2007 when it was surpassed by Burj Khalifa, but it is still the tallest tower in the western hemisphere surpassing the Willis Tower by 110 metres. It is an important telecommunications hub and a centre of tourism in Toronto. Toronto is a city of high-rises, having 1,800 buildings over 30 metres (98 ft), second only to New York City (which has over 5,000 such buildings) in North America. Most of these buildings are residential (either rental or condominium), whereas the central business district contains the taller commercial office towers. There has been recent media attention given for the need to retrofit many of these buildings, which were constructed beginning in the 1950s as residential apartment blocks to accommodate a quickly growing population. As of December 2011, Toronto had 132 high-rise buildings under-construction, which was the highest among all cities in North America, significantly beating Mexico City (88), New York City (86), and Chicago (17). Through the 1960s and 1970s, significant pieces of Toronto's architectural heritage were demolished to make way for redevelopment or, simply, parking. In contrast, since the 2000s, Toronto is experiencing a period of architectural revival, with several buildings by world-renowned architects having opened in the last five years. Daniel Libeskind's Royal Ontario Museum addition, Frank Gehry's remake of the Art Gallery of Ontario, and Will Alsop's distinctive Ontario College of Art & Design expansion are among the city's new showpieces. The historic Distillery District, located on the eastern edge of downtown, is North America's largest and best preserved collection of Victorian era industrial architecture. It has been redeveloped into a pedestrian-oriented arts, culture and entertainment neighbourhood. Modern glass and steel highrises have begun to transform the majority of the downtown area as the condominium market has exploded and triggered widespread construction throughout the city's centre. Trump International Hotel and Tower, Ritz-Carlton Toronto, Four Seasons Hotel and Residences, and Shangri-La Hotels and Resorts are just some of the many high rise luxury condominium-hotel projects currently under construction in the downtown core. The Old City of Toronto covers the area generally known as downtown, but also older and more densely populated neighbourhoods to the east, west, and north of downtown. It includes the historic core of Toronto and remains the most densely populated part of the city. The Financial District contains the largest cluster of skyscrapers in Canada, including the First Canadian Place, Toronto-Dominion Centre, Scotia Plaza, Royal Bank Plaza, Commerce Court and Brookfield Place. This area includes, among others, the neighbourhoods of St. James (not to be confused with St. James Town to the north), Garden District, St. Lawrence, Corktown, and Church and Wellesley. From that point, the Toronto skyline extends northward along Yonge Street. Old Toronto is also home to many historically wealthy residential enclaves, such as Yorkville, Rosedale, The Annex, Forest Hill, Lawrence Park, Lytton Park, Deer Park, Moore Park, and Casa Loma, most stretching away from downtown to the north. These neighbourhoods generally feature upscale homes, luxury condominiums and high-end retail. At the same time, the downtown core vicinity includes neighbourhoods with many recent immigrants and low-income families living in social housing and rental high-rises, such as St. James Town, Regent Park, Moss Park, Alexandra Park and Parkdale. East and west of Downtown, neighbourhoods such as Kensington Market, Chinatown, Leslieville, Cabbagetown and Riverdale are home to bustling commercial and cultural areas as well as vibrant communities of artists with studio lofts, with many middle and upper class professionals. Other neighbourhoods in the central city retain an ethnic identity, including two Chinatowns, the popular Greektown area, the trendy Little Italy, Portugal Village, and Little India, along with others. 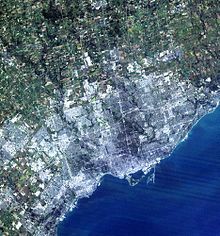 The outer suburbs comprising the former municipalities of Etobicoke (west), Scarborough (east) and North York (north) largely retain the grid plan laid before post-war development. Sections were long established and quickly growing towns before the suburban housing boom began and the emergence of Metro Government, existing towns or villages such as Mimico, Islington and New Toronto in Etobicoke; Willowdale, Newtonbrook and Downsview in North York; Agincourt, Wexford and West Hill in Scarborough where suburban development boomed around or between these and other towns beginning in the late 1940s. Upscale neighbourhoods were built such as the Bridle Path in North York, the area surrounding the Scarborough Bluffs in Guildwood, and most of central Etobicoke, such as Humber Valley Village, and The Kingsway. One of largest and earliest "planned communities" was Don Mills, parts of which were first built in the 1950s. Phased development mixing single-detached housing with higher density apartment blocks became more popular as a suburban model of development. To some this model has been copied in other GTA municipalities surrounding Toronto, albeit with less population density. Over the late 20th century and early 21st century, North York City Centre, Etobicoke City Centre and Scarborough City Centre have emerged as secondary business districts outside Downtown Toronto. High-rise development in these areas have given the former municipalities distinguishable skylines of their own with high-density transit corridors serving them. In the earlier industrial era of Toronto, industry became concentrated along the Toronto Harbour and lower Don River mouth. The Distillery District contains the largest and best-preserved collection of Victorian industrial architecture in North America. Once the largest alcohol processing centre in North America, related structures along the Harbour include the Canada Malting Co. grain processing towers and the Redpath Sugar Refinery. Although production of spirits has declined over the decades, Toronto still has a robust and growing microbrewery industry. The District is a national heritage site, it was listed by National Geographic magazine as a "top pick" in Canada for travellers. Similar areas that still retain their post-industrial character, but are now largely residential are the Fashion District, Corktown, and parts of South Riverdale and Leslieville. Toronto still has some active older industrial areas, such as Brockton Village, Mimico and New Toronto. In the west end of Old Toronto and York, the Weston/Mount Dennis and Junction areas have a sense of grit to them, as they still contain factories, meat packing facilities and railyards close to medium density residential. Beginning in the late 19th century as Toronto sprawled out, industrial areas were set up on the outskirts. Over time, pockets of industrial land mostly followed rail lines and later highway corridors as the city grew outwards. This trend continues to this day, the largest factories and distribution warehouses have mostly moved to the suburban environs of Peel and York Regions; but also within the current city: Etobicoke (concentrated around Pearson Airport), North York, and Scarborough. Many of Toronto's former industrial sites close to (or in) Downtown have been redeveloped including parts of the Toronto waterfront and Liberty Village, large-scale development is underway in the West Don Lands. The still mostly vacated Port Lands remain largely undeveloped, apart from a power plant, a shipping container facility and out-of-commission industrial facilities. There are future plans for development, including residential areas under the guidance of Waterfront Toronto. There are many large downtown parks, which include Grange Park, Moss Park, Allan Gardens, Little Norway Park, Queen's Park, Riverdale Park, Trinity Bellwoods Park, Christie Pits, and the Leslie Street Spit, which mainly consists of Tommy Thompson Park and opens on weekends. The Toronto Islands have several acres of park space, accessible from downtown by ferry. Large parks in the outer areas include High Park, Humber Bay Park, Centennial Park, Downsview Park, Guildwood Park, and Rouge Park. An almost hidden park is the compact Cloud Gardens, which has both open areas and a glassed-in greenhouse in downtown Toronto. Nathan Phillips Square, Harbourfront Centre, and Mel Lastman Square feature popular rinks for public ice-skating. Etobicoke's Colonel Sam Smith Trail opened in 2011 and is Toronto's first skating trail. Centennial Park and Earl Bales Park offer outdoor skiing and snowboarding slopes with a chair lift, rental facilities, and lessons. Ontario Place features the world's first permanent IMAX movie theatre, the Cinesphere, as well as the Molson Amphitheatre, an open-air venue for large-scale music concerts. As of spring 2012, Ontario Place has closed due to a decrease in attendance over the years. The Molson Amphitheatre and harbour still operate, however the park and Cinesphere are no longer operating. Each summer, the Canadian Stage Company presents an outdoor Shakespeare production in Toronto's High Park called "Dream in High Park". Canada's Walk of Fame acknowledges the achievements of successful Canadians, with a series of stars on designated blocks of sidewalks along King Street and Simcoe Street. The Distillery District is a pedestrian village containing boutiques, art galleries, restaurants, artist studios and small breweries, including the well-known Mill Street Brewery. A new theatre in the district, the Young Centre for the Performing Arts, is the home of the Soulpepper Theatre Company and the drama productions of nearby George Brown College. The production of domestic and foreign film and television is a major local industry. Toronto as of 2011 ranks as the third largest production centre for film and television after Los Angeles and New York City, sharing the nickname "Hollywood North" with Vancouver. Many movie releases are screened in Toronto before wider release in North America. The Toronto International Film Festival is one of the most important annual events for the international film industry. Europe's largest film studio, The Pinewood Studios Group, operates Pinewood Toronto Studios in the city's west-end. Toronto's Scotiabank Caribbean Carnival (formerly known as Caribana) takes place from mid-July to early August of every summer, and is one of North America's largest street festivals. Primarily based on the Trinidad and Tobago Carnival, the first Caribana took place in 1967 when the city's Caribbean community celebrated Canada's Centennial. More than forty years later, it has grown to attract one million people to Toronto's Lake Shore Boulevard annually. Tourism for the festival is in the hundred thousands, and each year, the event generates over $400 million in revenue into Ontario's economy. Pride Week in Toronto takes place in late June, and is one of the largest LGBT festivals in the world. One of the largest events in the city, it attracts more than one million people from around the world. Toronto is among the world's top international tourist destinations, ranking at 40th place, according to Euromonitor. 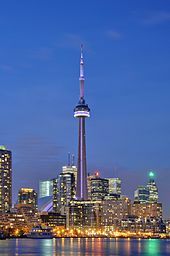 The city's most prominent landmark is the CN Tower, which once stood as the tallest free-standing land structure in the world at 553 metres (1,814 ft). To the surprise of its creators, the tower held the world record for over 30 years. The Royal Ontario Museum (ROM) is a major museum for world culture and natural history. The Toronto Zoo, one of the largest in the world, is home to over 5,000 animals representing over 460 distinct species. The Art Gallery of Ontario contains a large collection of Canadian, European, African and contemporary artwork, and also plays host to exhibits from museums and galleries all over the world. The Gardiner Museum of ceramic art is the only museum in Canada entirely devoted to ceramics, and the Museum's collection contains more than 2,900 ceramic works from Asia, the Americas, and Europe. The Ontario Science Centre always has new hands-on activities and science displays particularly appealing to children, and the Bata Shoe Museum features many unique exhibitions focused on footwear throughout history. The centrally located Textile Museum of Canada possesses another niche collection of great quality and interest. Other prominent art galleries and museums include Design Exchange, Museum of Inuit Art, TIFF Bell Lightbox, Museum of Contemporary Canadian Art, Institute for Contemporary Culture, Toronto Sculpture Garden, CBC Museum, Redpath Sugar Museum, University of Toronto Art Centre, Hart House, TD Gallery of Inuit Art and the future Aga Khan Museum. The city also runs its own museums, which includes the Spadina House. The Don Valley Brick Works is a former industrial site, which opened in 1889, and was partly restored as a park and heritage site in 1996, with further restoration and reuse being completed in stages since then. The Canadian National Exhibition is held annually at Exhibition Place, and it is the oldest annual fair in the world. It is Canada's largest annual fair and the fifth largest in North America, with an average attendance of 1.25 million. The Yorkville neighbourhood is one of Toronto's most elegant shopping and dining areas. On many occasions, celebrities from all over North America can be spotted in the area, especially during the Toronto International Film Festival. The Distillery District, Queen West, Harbourfront, the Entertainment District, the Financial District, and the St. Lawrence Market neighbourhood are also popular areas for tourists. The Eaton Centre is one of North America's top shopping destinations, and Toronto's most popular tourist attraction with over 52 million visitors annually. Greektown on the Danforth, is another one of the major attractions of Toronto which boasts one of the highest concentrations of restaurants per kilometre in the world. It is also home to the annual "Taste of the Danforth" festival which attracts over one million people in 2½ days. Toronto is also home to Canada's most famous "castle" – Casa Loma, the former estate of Sir Henry Pellatt, a prominent Toronto financier, industrialist and military man. Other notable neighbourhoods and attractions include The Beaches, the Toronto Islands, Kensington Market, Fort York, and the Hockey Hall of Fame. Toronto is the only Canadian city with representation in seven major league sports, with teams in the National Hockey League, Major League Baseball, National Basketball Association, Canadian Football League, Major League Soccer, Canadian Women's Hockey League and W-League. The National Football League's Buffalo Bills also play select home games in the city. The city's major sports venues include the Air Canada Centre, Rogers Centre (formerly SkyDome), Ricoh Coliseum, and BMO Field. Toronto is currently home to the only National Basketball Association franchise outside the United States. The Toronto Raptors entered the league in 1995, and have since earned five playoff spots in 15 seasons. The Raptors won the Atlantic Division title in the 2006–07 NBA season, led by former star player Chris Bosh. The Raptors are the only NBA team with their own television channel, NBA TV Canada. They and the Maple Leafs play their home games at the Air Canada Centre. The Toronto Rock are the city's National Lacrosse League team. They are one of the league's most successful franchises, winning five Champion's Cup titles in seven years in the late 1990s and early first decade of the 21st century, appearing in an NLL record five straight championship games from 1999 to 2003, and are currently first all-time in the number of Champion's Cups won. The Rock share the Air Canada Centre with the Maple Leafs and the Raptors. Toronto was home to the International Bowl, an NCAA sanctioned post-season football game that pitted a Mid-American Conference team against a Big East Conference team. 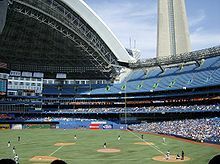 Beginning in 2007, the game was played at Rogers Centre annually in January. Toronto, along with Montreal, hosts an annual Tennis Tournament called the Rogers Cup between the months of July and August. In odd-numbered years, the men's tournament is held in Montréal, while the women's tournament is held in Toronto, and vice-versa in even-numbered years. Besides team sports, the city annually hosted Champ Car's Molson Indy Toronto at Exhibition Place from 1986 to 2007. The race was revived in 2009 as the Honda Indy Toronto, part of the IndyCar Series schedule. Both thoroughbred and standardbred horse racing events are conducted at Woodbine Racetrack in Rexdale. Historic sports clubs of Toronto include the Granite Club (established in 1836), the Royal Canadian Yacht Club (established in 1852), the Toronto Cricket Skating and Curling Club (established in pre-1827), the Argonaut Rowing Club (established in 1872), the Toronto Lawn Tennis Club (established in 1881), and the Badminton and Racquet Club (established in 1924). Toronto was a candidate city for the 1996 and 2008 Summer Olympics, which were awarded to Atlanta and Beijing respectively. The Canadian Olympic Committee was considering a Toronto bid for the 2020 Games, however, in August 2011 it was announced that Toronto would not bid for the 2020 games. It has been suggested that Toronto may bid for the 2024 Summer Olympics. Toronto will be hosting the 2015 Pan American Games in July 2015. It contested against the cities of Lima, Peru and Bogotá, Colombia. Toronto is a major international centre for business and finance. Generally considered the financial capital of Canada, Toronto has a high concentration of banks and brokerage firms on Bay Street, in the Financial District. The Toronto Stock Exchange is the world's seventh-largest stock exchange by market capitalization. The five largest financial institutions of Canada, collectively known as the Big Five, are headquartered in Toronto, as are a majority of Canada's corporations. The city is an important centre for the media, publishing, telecommunication, information technology and film production industries; it is home to Bell Media, Rogers Communications, and Torstar. Other prominent Canadian corporations in the Greater Toronto Area include Magna International, Celestica, Manulife Financial, Sun Life Financial, the Hudson's Bay Company, and major hotel companies and operators, such as Four Seasons Hotels and Fairmont Hotels and Resorts. Although much of the region's manufacturing activities take place outside the city limits, Toronto continues to be an important wholesale and distribution point for the industrial sector. The city's strategic position along the Quebec City – Windsor Corridor and its extensive road and rail connections help support the nearby production of motor vehicles, iron, steel, food, machinery, chemicals and paper. The completion of the Saint Lawrence Seaway in 1959 gave ships access to the Great Lakes from the Atlantic Ocean. The city's net debt stood at $4.4 billion as of the end of 2010 and has a AA credit rating. Toronto is expected to pay $400 million of the debt in 2011. The city's debt increased by $721 million in 2010. The city’s unemployment rate was 8.1% in November 2011, down from 8.3% year over year. Toronto is home to a number of post-secondary academic institutions. The University of Toronto, established in 1827, is the oldest university in Ontario and a leading public research institution with two satellite campuses, one of which is located in the city's eastern district of Scarborough while the other is located in Mississauga.. It is a worldwide leader in several fields, including biomedical research. It houses North America's fourth-largest university library system, after those of Harvard, Yale and Berkeley. The Osgoode Hall Law School, affiliated with Toronto's York University, houses the largest law library in the Commonwealth of Nations. Toronto is also home to Ryerson University, OCAD University, and the University of Guelph-Humber. There are four diploma and degree granting colleges in Toronto. These are Seneca College, Humber College, Centennial College and George Brown College. The city is also home to a satellite campus of the francophone Collège Boréal. In nearby Oshawa, usually considered part of the Greater Toronto Area, are Durham College and the University of Ontario Institute of Technology, while Halton Region is home to Sheridan College. The Royal Conservatory of Music, which includes the Glenn Gould School, is a school of music located downtown. The Canadian Film Centre is a film, television and new media training institute founded by filmmaker Norman Jewison. Tyndale University College and Seminary is a transdenominational Christian post-secondary institution and Canada's largest seminary. The Toronto District School Board (TDSB) operates 558 public schools. Of these, 451 are elementary and 102 are secondary (high) schools. This makes the TDSB the largest school board in Canada. Additionally, the Toronto Catholic District School Board manages the city's publicly funded Roman Catholic schools, while the Conseil scolaire de district du Centre-Sud-Ouest and the Conseil scolaire de district catholique Centre-Sud manages public and Roman Catholic French-language schools. There are also numerous private university-preparatory schools. The Toronto Public Library is the largest public library system in Canada and the most widely used, consisting of 99 branches with more than 11 million items in its collection.